AUSTRALIAN crossbred and fine Merino wool prices increased this week, with resultant prices in foreign currencies reflecting strong underlying demand. AWEX senior market analyst Lionel Plunkett said crossbred wools were by far the best performing sector this week, and contributed to positive movement in the Eastern Market Indicator. The AWEX EMI listed 7 cents to 1934c/kg clean and in US$, the EMI rose 33 cents to US1405c/kg, as the A-US exchange rate rose US1.44 cents to US72.67 cents. “The EMI has now recorded an increase for the five consecutive weeks, for a total increase of 85 cents,” Mr Plunkett said. Executive director of the National Council of Wool Selling Brokers of Australia, Chris Wilcox, said the larger EMI lift in US$ terms suggested that underlying demand is still strong. While the EMI was up sharply in US$ terms, it was also 19 €cents higher to 1222 € c/kg and was 120 RMB higher at 9418 RMB/kg, Mr Wilcox said in the latest NCWSBA newletter. Mr Plunkett said prices for crossbred wool 26-28 micron this week lifted 80 to 100 cents and all other microns were generally 25 to 45 cents dearer. Mr Plunkett said the Merino sector performed with mixed results this week. “Better style wools, with favourable additional measurement results continue to attract excellent buyer support, resulting in very little change for these types. “Off-style types, wools carrying higher vegetable matter (vm) and those with high mid-breaks lacked the same support,” he said. “The 20 to 40 cent reduction in these wools was the driving force behind the reductions in the individual micron price guides (MPGs). “Long low vm types continue to outperform the rest of the skirting market and these wools recorded very little change for the series,” he said. Mr Plunkett said prices for the increasing supply of higher vm types eased, however; generally between 25 and 45 cents, with lots carrying fault such as cott and colour most-affected. Mr Plunkett said 38,830 bales were offered to the trade this week, 2927 fewer, and 7.2 percent was passed in. “When compared to the corresponding sale of 2018, the total amount of bales offered is down by 177,047 bales, a reduction of 15.7pc. The Australian Wool Innovation weekly market report said pre-sale discussions centred around the continuing state of new volume forward business being hard to come by at fair and reasonable current market levels. 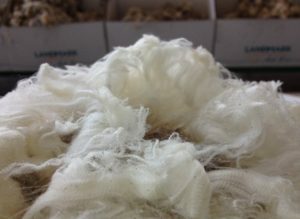 Reflecting on the improvement in crossbred wool prices, AWI said with Merino prices relatively high and volumes of the same are worryingly low, our overseas manufacturing partners are obviously looking to other sources to continue to participate. “Whilst a move towards a higher percentage of synthetic blends is always on the cards, the crossbred wools have seemingly become first choice for cheaper blend components and have been heavily targeted to keep mills churning out garments. Currently, there are 40,426 bales rostered for sale in Sydney, Melbourne and Fremantle, and quantities in the following two weeks fall sharply to just over 30,000 bales each.